Spring and fall, it's when the trail work gets done in these parts. 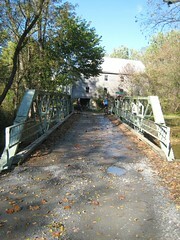 Sunday was the Frederick Watershed. It may be full of rocks and hold up well to the elements, but that doesn't mean it still doesn't need TLC from time to time. 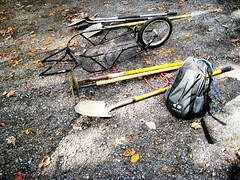 A baker's dozen of us showed up and DK had us on BOB patrol, hauling tools into the work locations. A good time with some good people. Afterwards we finished off the day properly by refueling with food and some good local beers. There's a few more work days on the books, so if you are looking for good trail karma we have one scheduled for Sunday November 11th at Gambrill State Park. We are finalizing details so email me at riderx AT singlespeedoutlaw DOT com if you want to be on the update list for where to meet. How about a little SSWC07 flash back and 2008 update? On YouTube you can see a nice little documentary style piece done about the race. I was interviewed for it but it looks like it got left on the cutting room floor. Boo hoo. No matter, I spotted Outlaws Ricky d and JoJo right in the beginning and Spearmint in action on the trail later on. 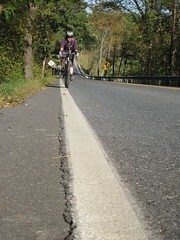 Plus Rob from DE has an interview and Kera from Spok Bags is cranking it out on the rollers. Spotted lots more friends and familiar faces too. Nicely done piece. You can find a second video that has a nice "from the pilot's seat" perspective here. Take your Dramamine before watching if you get motion sickness. And last, the SSWC08 web site is up. Just a contact email address and a place holder for future info, but people seem to already be clamoring for details when we are 10 months out. Relax, ride your bike, have a beer. Info we come in due time. 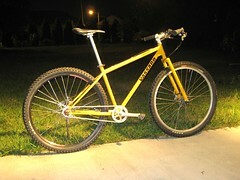 So, I dropped a hint a few posts back that Vassago was sending over a Jabberwocky frame and fork for testing. 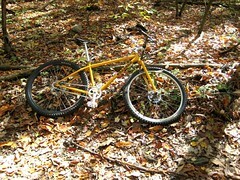 Steel, 29er, single speed. It arrived last week and I finished building it on Saturday night. There will be a short and long term review plus the usual bits and pieces that come out here from day to day riding. I tore down the Kelly frame, who lately looks like she's been in a street brawl, to get the parts for this build. That will leave me with the QBall and the Vassago as the 29ers in the stable. I think this will be an interesting pair to ride since they are both steel, disc only, 29er frames that fall in the same price range. The fit and set up of the Kelly really feels good to me, so I recorded all kinds of measurements before I took it apart. Before the Vassago arrived I compared the frame numbers to the Kelly and they looked pretty similar which was good. Once I started assembling it became apparent that the sizing of the frames in many respects was really, really close to the Kelly. Set up was a breeze. One thing I did note was the head tube was about a half inch shorter on the Jabberwocky which meant sticking another fat spacer on the steerer to get things in place. The seat tube was a bit shorter yielding more stand over and more seat post sticking out. Otherwise things seemed dead on. It was only out for a short spin Sunday with flat pedals and work boots for the trail work day, so no real feel for the handling yet, but I'm taking out today for a spin to see how it feels. More on that later. Took a bunch of pix of the frame and fork before the build, you can check out all of the naked ones here. We finally got some much needed rain. For three days straight it fell steady, buggering the mid-week ride but that's OK, we really needed it. Because of the drought conditions we've had this summer there has been plenty of great riding and few to no rain outs, so I'll gladly sacrifice a little saddle time for some steady precip. Woke to rain on Saturday even though it was due to stop around 3am. This pushed back the road riding plans a few hours. It stopped mid-morning and then the dark and gray gave way to bright blue beautiful skies and the temp crept up around 70F. 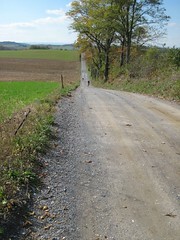 A few of us headed out for 33 or so miles of gravel and pavement in the north eastern part of the county. 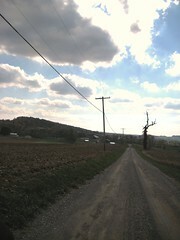 Great country riding on roads that rarely see cars. Finished building the Jabberwocky Saturday night. Look for more details soon followed by a short and long term review. Snapped a quick night time picture after the build and another on the Watershed trail work day where I was running flat pedals with my work boots. Different riding like that for sure.